As I always mention, I really like these ongoing threads that encourage practice and give people a chance to share their projects, ask questions, and get inspired. I have recently become interested in making containers from natural materials and I know some of you like @OrienM are already amazing at it. I'm at the very beginning of the learning stages, so I'll be posting projects here in the future and I hope you'll join me. Some of you have some amazing projects from the past, so please feel free to re-post old photos here for inspiration. We can keep the criteria pretty loose. 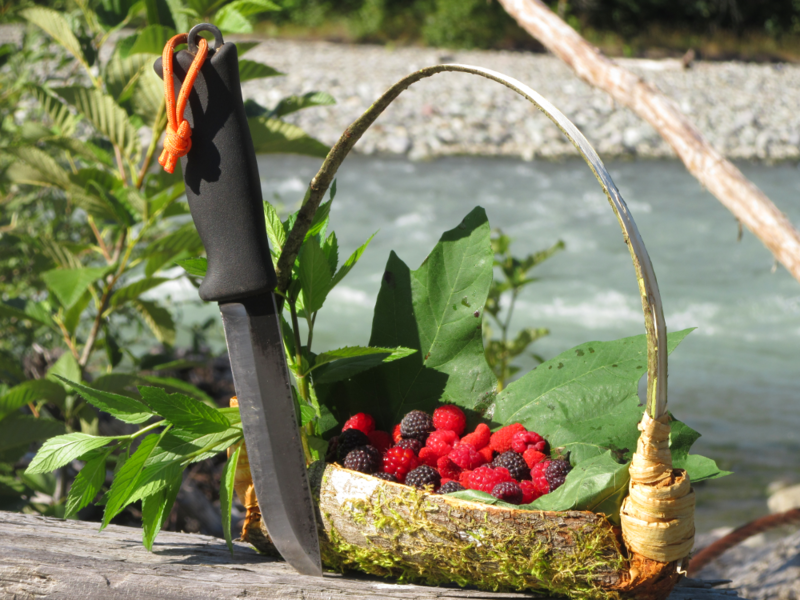 If you can reasonably call it a container and you made it out of natural materials; post it up! Baskets, bags, boxes, bottles, cups, sheaths, pouches and anything else that I'm forgetting are all welcome. The only limitation I would like to impose is that what you post should be made from materials that you collected in nature. For example, we already have other threads for leather work, but if you harvested it from an animal yourself, then that definitely qualifies. I'm looking forward to seeing your posts! Jonah L. Archer, Brook Trout, pellegrino and 30 others like this. As I mentioned, I'm brand new to this and only made my first natural materials container last month. 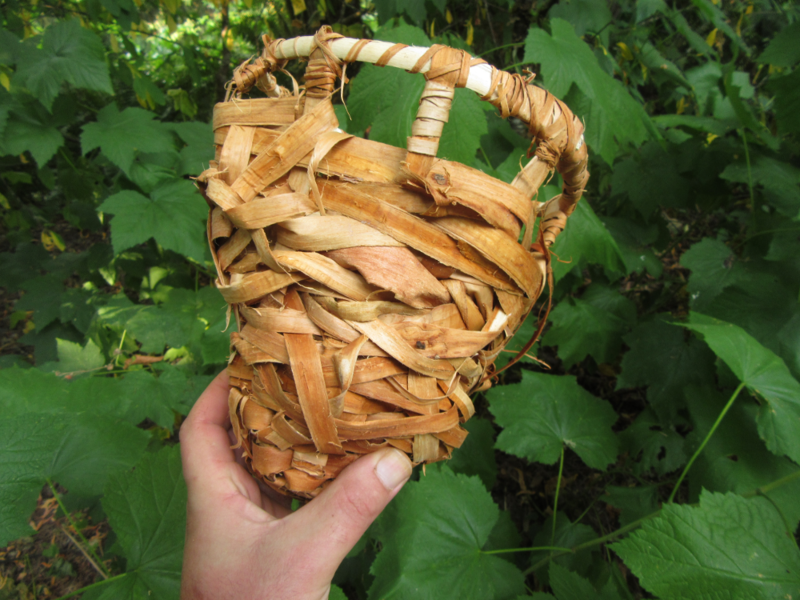 For that project I adapted a technique usually used with cedar bark to make this little maple bark foraging basket. This same design was used as a canoe bailer by the indigenous people of the Northwest so it is supposed to be water tight, but I wasn't careful enough and cracked mine. It still worked fine for berries though. Today I figured I'd take my first crack at a proper woven basket. This was a spur of the moment idea, and I haven't studied any particular techniques yet, so I was just kind of winging it based on the limited amount of info that I've seen in the past. 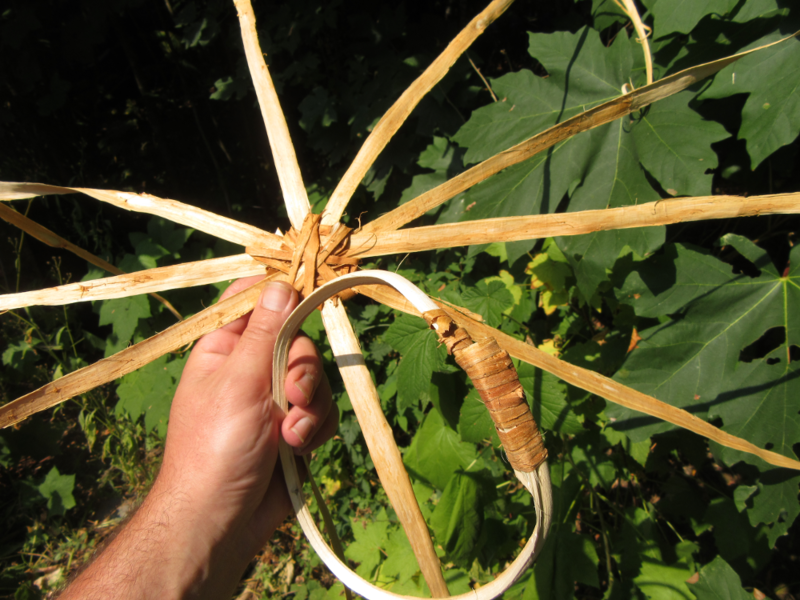 I started with some maple bark strips lashed in a star pattern, and a piece of maple bent into a ring for the top. I fiddled with it for a while, trying different ways of attaching the supports and eventually came upon a design that seemed to be working. I was really happy with how it was coming out at this point. I made one of the supports too long which made the frame lop-sided, but it was good enough for a first attempt. Not knowing what I was doing, I just kind of started feeding strands of bark through the supports. That led to lots of gaps in between, so I started doubling back and looping over trying to keep things tight. Still learning, I tried different ways of attaching, looping, tying, and twisting to get things to lay right. This resulted in total chaos. 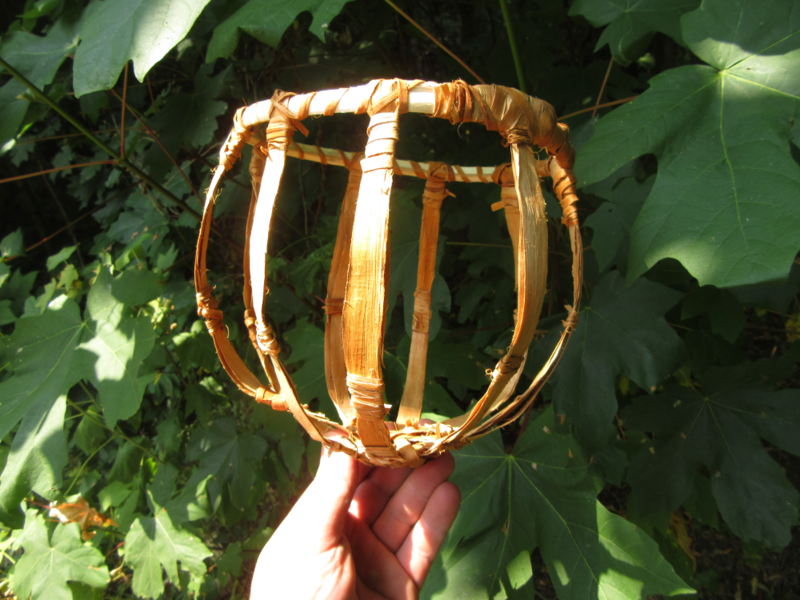 When I started the project, my idea was to see if I could make a basket in under and hour. Three hours later, I ran out of time and material and was left with this ugly unfinished bark tangle. Obviously I have long way to go, and I'm sure it will be helpful for me to learn some actual techniques instead of just winging it, but sometimes it's fun just to dive right in. Despite being ugly, it feels really strong, so I will finish it at some point. pellegrino, Carabnr, Medicine maker and 40 others like this. NevadaBlue, central joe, bacpacjac and 8 others like this. Great idea for a thread @NWPrimate...as most of y'all know I'm a bit of a basket nut. I will go dig up a few pics of my baskets and bags to post . I like your baskets, too! A very respectable first weaving effort there...I call that particular style "free weave", and there are some really elegant Japanese baskets woven that way. A suggestion, you might try adding the rim last next time...you'll probably have an easier time weaving with the ribs free. PS, it takes me about two hours to make a pretty rough little yucca basket, going as fast as I can. Finishing one in an hour would be most impressive for anybody, especially a newbie. Slow down, take your time. 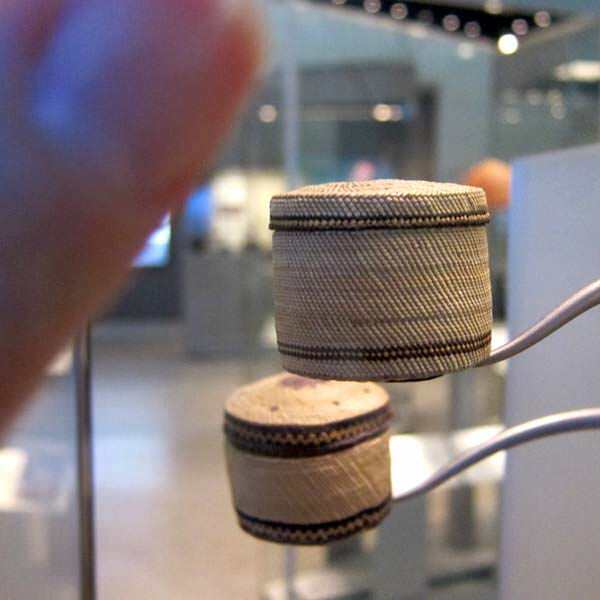 Basketry is not a fast craft in general. Brook Trout, Phantom X Chic, happywanderer and 13 others like this. Well, I'm guessing my store bought sissel and jute "basket bag" I'm working on won't count. I just so happen to have some birch kicking around if @Bitterroot Native doesnt mind me dipping into his supply! Brook Trout, happywanderer, NevadaBlue and 10 others like this. Nope, bags are containers too...post it up! It's a really cool bag...have you gotten pretty far on the sides by now? Brook Trout, happywanderer, NevadaBlue and 8 others like this. I like your baskets, too! A very respectable first weaving effort there...I call that particular style "free weave", and there are some really elegant Japanese baskets woven that way. Thanks @OrienM . It's been fun playing around with it so far. I enjoy being at the complete beginner stage of a new skill. It's exciting when there is so much that you don't know and you learn a lot with each practice session. It's great to hear that "free weave" is an actual technique. I think mine might have been a little too free. Thank you for the suggestions! I will put them to good use and welcome any others if you have time to comment on future projects. I've seen what you can do and I know there's a lot I can learn from you. I'm still struggling with photos held hostage by photobucket but do have a couple pics 0f my baskets handy to show. 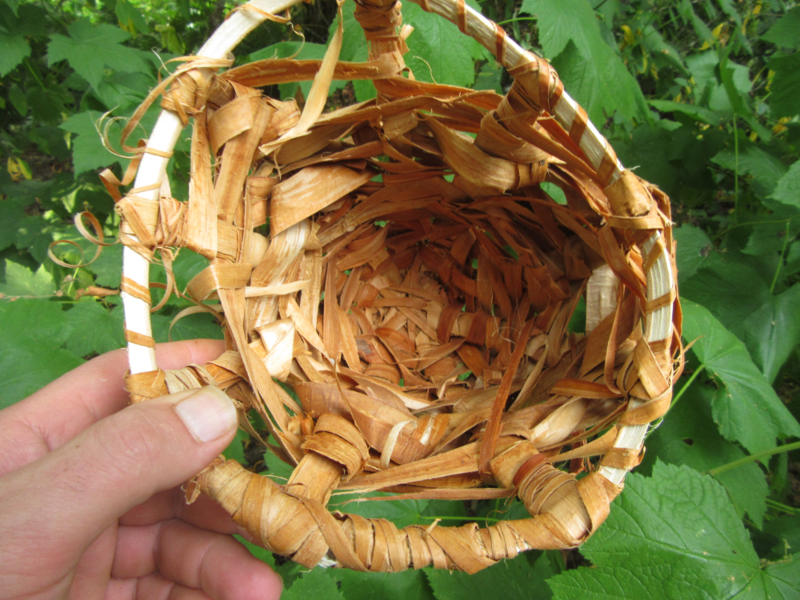 My pack basket, split bamboo woven in a hexagonal pattern, with some added parts made of yucca leaves. The braided straps, unfortunately, didn't survive long; they've now been replaced with cotton webbing. This turned out to be really comfy pack, both light and tough, and I still use it daily. Another pack, this one more of a textile bag, made of looped cordage. Yucca, with stripes of dogbane. Except for the straps, this is one continuous piece of cordage, probably 150-200'. So, bring on the baskets and containers! NVRDONE, Brook Trout, Medicine maker and 38 others like this. happywanderer, NevadaBlue, central joe and 7 others like this. I'll put this in here for now and come back when I get some more progress; "Rope Basket" Bag; Build Along. I'll be watching this one..
Brook Trout, NevadaBlue, ArmyMacE and 8 others like this. Not gonna laugh, cause knowing you, in about a month you'll be pushing some awesome stuff. First ones are not too shabby either! Brook Trout, NevadaBlue, central joe and 8 others like this. great job on the baskets @OrienM those look awesome! Brook Trout, NevadaBlue, Winterhorse and 8 others like this. NevadaBlue, central joe, bacpacjac and 3 others like this. I think the video is a great demonstration of a method to deal with the problem of boiling water and cooking food without a metal cooking container. I had previously assumed that most natural containers would require the "drop hot rocks in it!" method to heat their contents, but this has clearly changed my mind. 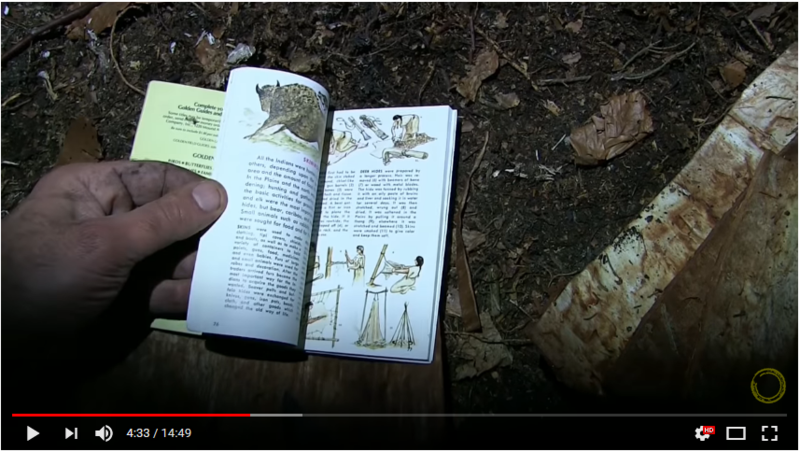 I didn't catch if the maker of the video explained the details of the method (how thick/thin the bark needs to be to be protected by the liquid in the container) but I may follow up on the book he referenced to see if there are more notes there. 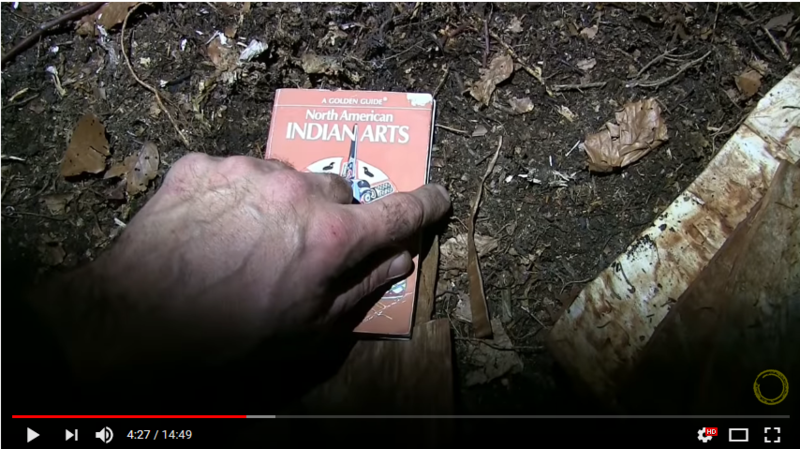 Lonnie from Far North Bushcraft and Survival also demonstrates this technique with a birch bark container boiling water over coals (now that I know to search for it, seeing a lot of videos on this technique). Brook Trout, alukban, NevadaBlue and 11 others like this. This is a pack basket Jake and I made for his FR Summit Exp. We had grabbed a damaged split ash laundry basket from a flea market, took it apart, and re-used the splits to make this. The only thing we added were the straps, and some jute twine for binding the top. colter, Blackhawk45hunter, steene and 19 others like this. And a birch bark 32oz water bottle I made with only bark and jute twine. I'm especially proud of this effort. Completely watertight and guaranteed for life never to break LOL. Phantom X Chic, Blackhawk45hunter, steene and 17 others like this. Brook Trout, NevadaBlue, Winterhorse and 7 others like this. Dillon Finan, NevadaBlue, Winterhorse and 16 others like this. That was cool @rsnurkle ! It does make sense that if a paper cup can handle the flames, then bark would as well. As soon as I saw this book, I immediately recognized it as one that I had in my collection as a kid. I just ordered another copy. Awesome job @Pastor Chris ! Brook Trout, NevadaBlue, Winterhorse and 9 others like this. When I started reading this I thought you were going to post about your wooden water bottle project, but I see you've moved past carved wood to unbreakable birch bark! Brook Trout, NevadaBlue, Winterhorse and 6 others like this. So I've got a project in the doldrums, my rope basket build. How did you knot that bag? I'm kind of set on using this one strand the whole height of the bag. Brook Trout, NevadaBlue, Winterhorse and 5 others like this. Stop giving me ideas for a new project! NevadaBlue, ArmyMacE, Winterhorse and 5 others like this. Dillon Finan, D.K, Seahunter and 20 others like this. I've got a project to work on..
NevadaBlue, Winterhorse, central joe and 2 others like this. We lived in Apache country when I was a little boy. Our car was a PINK Chrysler stationwagon with a hemi engine. We were out one morning when the fan belt snapped and no spare. Desert dwellers quickly learn rubber and batteries have shorter lifespans in heat. Apache cowboy rides up from a small cattleherd. He cut some yucca and wove a fan belt. We drove back to the local gas station at a safe and sane 35 MPH and the attendant had to cut it off. Brook Trout, LongChinJon, happywanderer and 8 others like this. I knew yucca fiber was crazy strong (I've lifted myself off the ground on a 1/4" thick cord) but a fan belt! Wow. So, I just noticed I left @CivilizationDropout hanging for like two months on his question about looping (sorry, man! ). Hope you got it figured out, and I didn't hold your whole project up. In case you didn't: they are half hitches. Each stitch is just a half hitch knot, the loose end goes through a loop on the row below, then through the loop you just made. Adjust the size of the loop, and repeat...endlessly . I eye-splice the loose end back into the cord at the top of the bag to finish up. Other repeated knots will also work; if you google "knotless netting" you can find images of a bunch of options. Brook Trout, happywanderer, NevadaBlue and 6 others like this. I worked one summer curating The Southwest Museum's cowboy tack collection and enjoyed what was then one of the finest basketry collections. There were a few so tiny they were displayed under a magnifying glass up to fragments of one big enough for a two person hottub-which it was. The blur in the foreground is my thumb and thumbnail on the glass a few inches away, for reference. You can also make a soap from yucca roots. the petals are delicious when new in salads and the stalks can be boiled into a kind of sweet potato consistency looking very grey and tasting something like ELMERS GLUE. The tips on the leaves make decent needles. They used to blanket the local hillsides before the drought and development reduced their numbers. Dillon Finan, D.K, bradleybuckman and 19 others like this. That looks great! Where is the kit from? Thank you, I'm trying to figure out my next stage, the current design is taking WAY TO LONG with the minimal time I've been able to throw at it. NevadaBlue, Winterhorse, OrienM and 3 others like this. NevadaBlue, Winterhorse, CivilizationDropout and 3 others like this. That's who I used for the pack basket build and Natalie's little basket. They where good for me, I'm planning on making more eventually. NevadaBlue, Winterhorse, central joe and 3 others like this. Brook Trout, NevadaBlue, Winterhorse and 2 others like this. Lots of sizes of rattan reed; they also have ash splits. Brook Trout, NevadaBlue, Winterhorse and 4 others like this. Brook Trout, happywanderer, NevadaBlue and 5 others like this. Big leaf maple bark boiling vessel. I initially intended to pinch the stripped ends and make a canoe bailer design, but on my first attempt that day, I ended up cracking it in several places; so I approached it a bit differently in hopes of avoiding the same result. 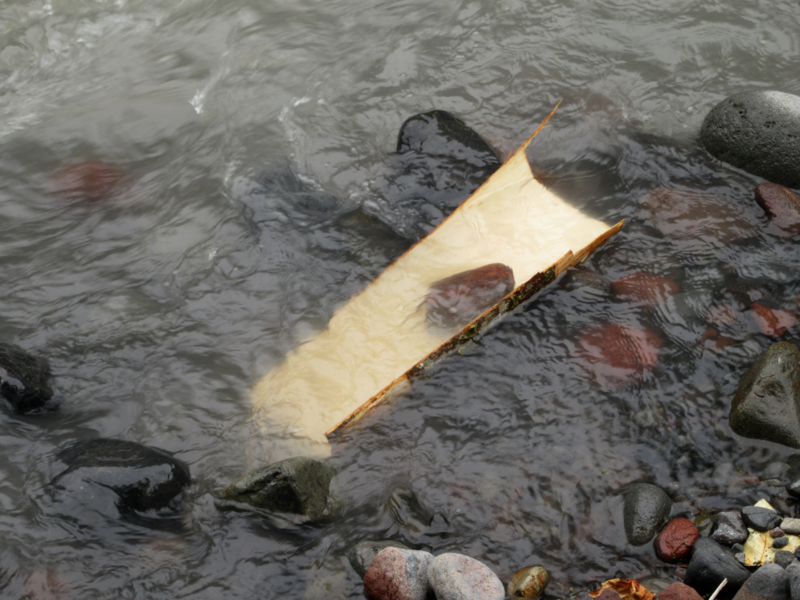 With the first attempt, I soaked the entire sheet in the water before starting to work with it; with the intention of softening the bark and making it more flexible. 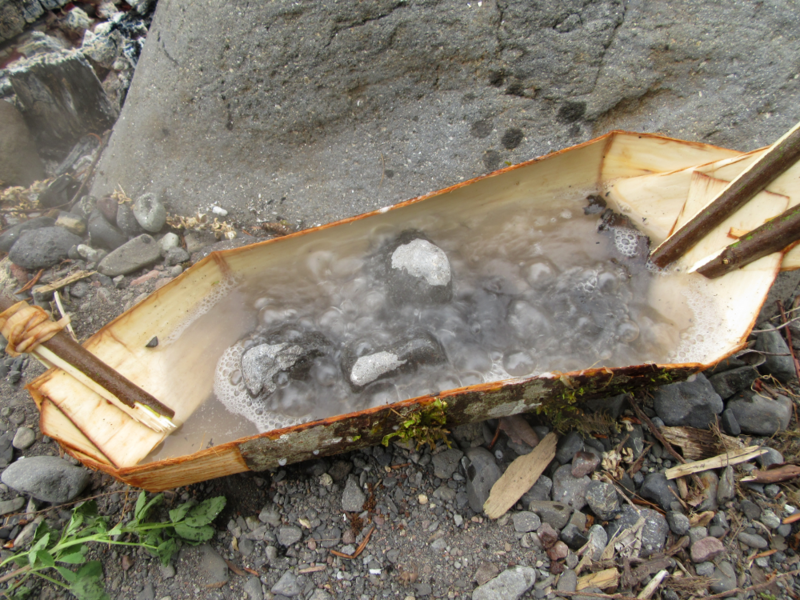 However, in the process the outer bark absorbed water too, which made it much more difficult to remove. 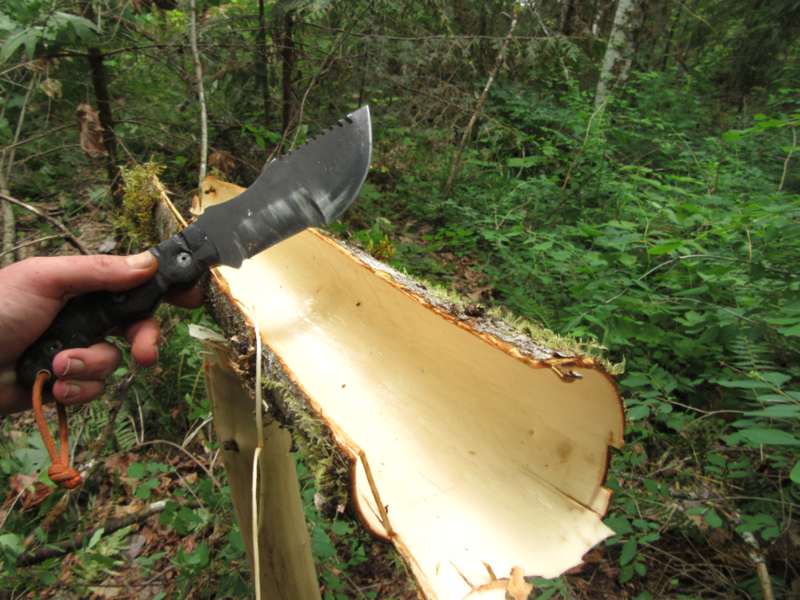 This time carefully scored and folded the sheet to crack the outer bark, and used a knife to remove it rather than peeling it away by hand. Once that was removed, I put it into the creek to soften. Instead of pinching the ends together, I used the method that @rsnurkle shared in the video above; making clothespins to secure folded corners. It didn't come out perfect, but much to my delight, it held water this time! Dropping hot rocks from the fire boiled the water very quickly. It was probably only a minute between the first rock hitting the surface achieving a rolling boil. That worked so well that it almost felt like cheating, so I tried using the same container to boil directly on the coals. I set it up on the rocks that I used for boiling the first time to lift it up far enough that I could push new coals underneath. This took a lot longer and a lot more babying. It took almost thirty minutes to get a good simmer going. I never got the comforting big bubbles that came with stone boiling, but it did simmer long enough that I was comfortable that any harmful organisms would be killed. Someone pointed out that I could have sped up the process with a rudimentary lid, so I will try to keep that in mind next time. Besides taking longer, it obviously put a lot more wear and tear on the container and leaked more of the tannins from the bark into the water. The first batch that was stone boiled had a mild maple flavor to it and was relatively clear, but this one got a lot darker and had a stronger taste. Stone boiling is the clear winner here, but it is good to know that this material and design can withstand the heat long enough to boil at least one batch. Dillon Finan, Brook Trout, wsdstan and 17 others like this. NevadaBlue, NWPrimate and rsnurkle like this. Still working on it buddy. Dillon Finan, Brook Trout, Blackhawk45hunter and 7 others like this. This is a great note about the construction process: the different properties of inner versus outer bark, wet and dry. It's not something I would have initially thought to pay much attention to. 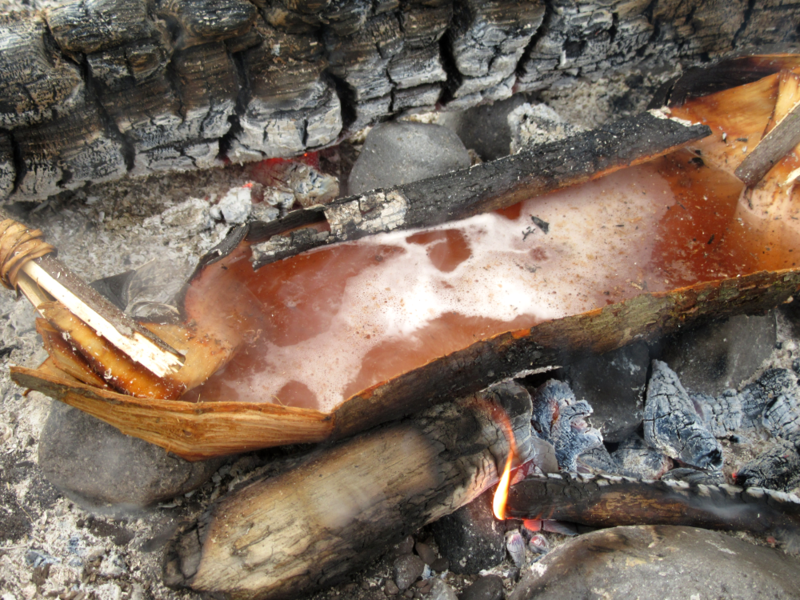 I went back into my notes and found a video focusing on making the bark pot from Bushcraft Bear's goulash video above, and he takes the time to remove all of the outer bark before wetting, folding, and cooking with the container. I wonder if removing the outer bark fully (not just on the sections to be folded) also helps with the heat transfer? Probably not up to rock-boiling speed, though. How did you like the folding and clothespin method you settled on in this case? I've used it with non-bark materials with varying success. I test ran a printer paper and chopsticks container while in my office, and then tried that folding and pinning method again outside with paper from a bagel sandwich. The thin paper unfortunately revealed that the sturdyness of the material is very important: this material had a slit/slow leak in the bottom anyway, but the first issue I ran into was the flexible sides sagging so low that water spilled out as soon as I poured it in. I think this would be less of a problem with most barks, since the size of tree needed to get a reasonable size sheet for the container probably has a thick enough inner bark layer to be sturdier than the paper my bagel was wrapped in. Dropping hot rocks from the fire boiled the water very quickly. It was probably only a minute between the first rock hitting the surface achieving a rolling boil. ... I set it up on the rocks that I used for boiling the first time to lift it up far enough that I could push new coals underneath. This took a lot longer and a lot more babying. It took almost thirty minutes to get a good simmer going. ... The first batch that was stone boiled had a mild maple flavor to it and was relatively clear, but this one got a lot darker and had a stronger taste. That is a big difference in terms of speed and looks like an equally big difference in taste. I had been most curious about bark over coals as a method to get away from potential dirt and ash from putting the rocks in, but if the food is going to be bark-flavored (even with a lid to protect from ash), there may be a very good reason why rock boiling is the primitive method that shows up the most in history books. At the moment, I don't remember what they said (or didn't say) about lids and protecting the maple syrup/sap from ash from the fire. Brook Trout, Blackhawk45hunter, steene and 6 others like this. 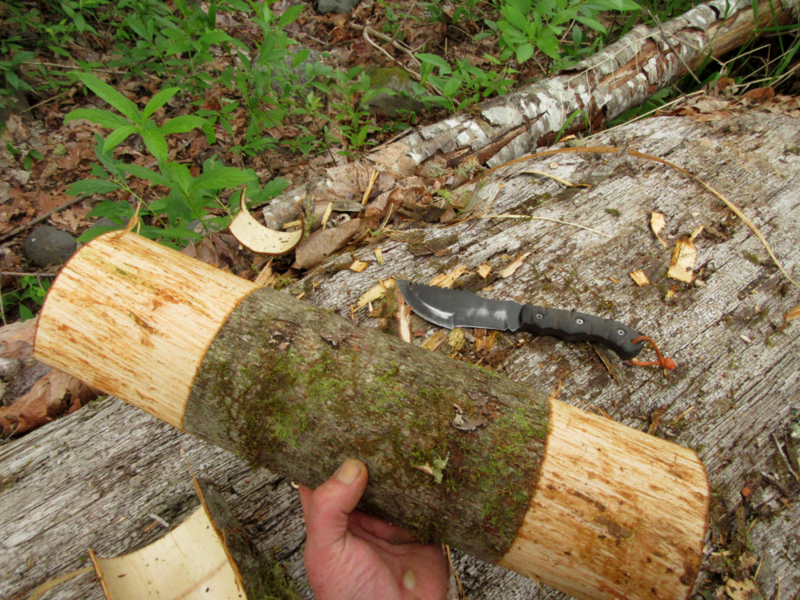 I went back into my notes and found a video focusing on making the bark pot from Bushcraft Bear's goulash video above, and he takes the time to remove all of the outer bark before wetting, folding, and cooking with the container. I went out with the idea that I was going to make the cedar canoe bailer design which incorporated leaving the outer bark intact on the bottom so removing it all didn't even occur to me at the time, despite having seen that video. It does look it does look like stripping it completely would be worth experimenting with. It might help with the heat transfer you mentioned, but I don’t think I’ll bother with putting bark directly on the fire again after seeing how well the rocks worked. The advantage that I see there is the potential for having more flexibility over-all, which could help make it easier to fold without cracking. It seemed simple and ended up being totally functional, so I don’t see any problem with using it, especially if you bind the clips to keep them from splitting out all the way. I do want to keep trying with the pinched ends, because I think that it has the potential to result in a sturdier container and provides an easy way to include a handle. If I can get good at making one design of container that could function both as a basket and a cooking device, that would be ideal. I’m not sure how that will end up playing out, but the thought of time spent practicing a skill having multiple practical applications definitely appeals to my nature. I test ran a printer paper and chopsticks container while in my office, The thin paper unfortunately revealed that the sturdyness of the material is very important: this material had a slit/slow leak in the bottom anyway, but the first issue I ran into was the flexible sides sagging so low that water spilled out as soon as I poured it in. I did something very similar a few months ago to get an idea of how I might fold it, but never tried putting water into it. 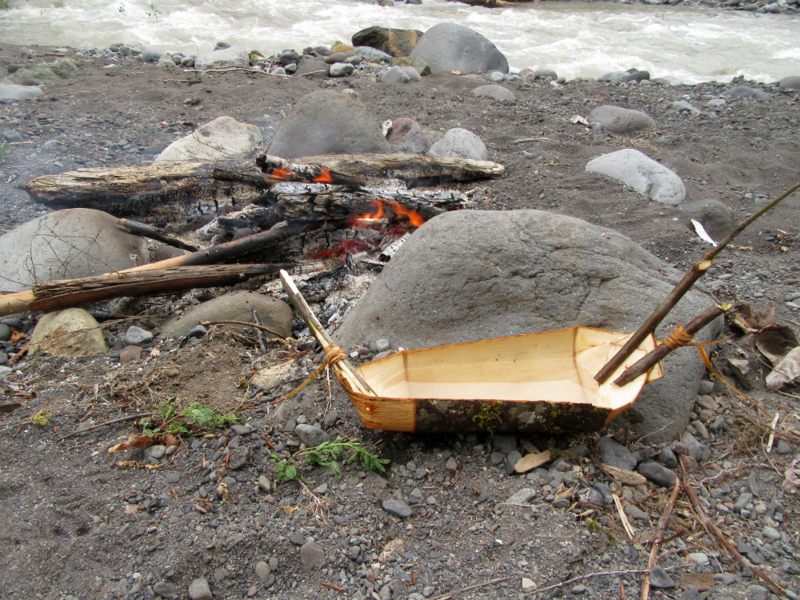 I might be one of the few people on the planet to find humor in academic papers, ... "when birch bark comes directly in contact with flames, it will ignite"
Brook Trout, Winterhorse, NevadaBlue and 2 others like this. Dillon Finan, D.K, Brook Trout and 21 others like this. Brook Trout, Robert Y, Brew-Jitsu and 6 others like this. Thanks, it was a big job! There's almost 500' of cord in that thing; I irritated my right thumb pretty badly with all the reverse-twisting, and it hurt for days afterwards (worth it, though... ). I really need to learn the leg-rolling technique for stuff like this. Brook Trout, Brew-Jitsu, Winterhorse and 7 others like this. Brook Trout, Winterhorse, NevadaBlue and 4 others like this. Brook Trout, Winterhorse, NevadaBlue and 3 others like this.